Ya'll know that my Mike is a Land Surveyor. He's out in it daily: mud, muck, grass, dirt -- whether rain or shine, wind or snow. He gets dirty. Filthy dirty. Sometimes... I make him take his clothes off as soon as the door closes and put them in the laundry bin. I've been using Purex for many years. It's a great detergent. But there have been some stains that just would NOT come out. 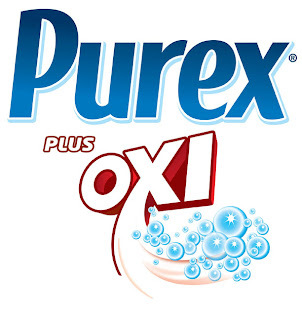 When given the opportunity to try the new Purex Plus Oxi, I jumped at the chance! Trust me, this new detergent did NOT let me down! I made two piles -- one with Mike's work pants and one with his work shirts. I didn't pre-treat. After the wash, I looked over every inch of those clothes -- no stains. What a relief. One thing did concern me: Mike has very sensitive skin. I wondered if the addition of the Oxi would make the clothes "itchy". Nope. Mike hasn't had a single reaction -- no itching, no scratching! Thank you, Purex! 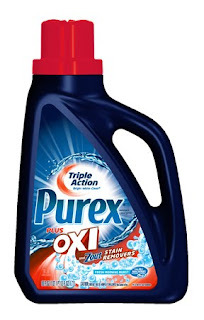 Purex wants you to Scare Away Stains with Purex Plus Oxi! This is a great new Sweepstakes from Purex! It runs from 10/15 to 11/16/12! There will be one (1) Prize. The Prize winner will receive $1,000 in the form of a check or gift card and a (1) year supply of Purex plus Oxi detergent in the form of 10 “Free Coupons” valued at up to $6.00 per coupon. The promotion allows users to sign up for special savings on Whirlpool appliances. There will be one (1) Prize. The Prize winner will receive a 4.3 cu. ft. Whirlpool Duet® Steam Front Load Washer with Precision Dispense Ultra, a 7.4 cu. ft. Whirlpool Duet® Steam Electric Dryer with Advanced Moisture Sensing and pedestals. Prize includes delivery and set in place only. Installation and removal of old appliances are not included. The sweepstakes is hosted as a Facebook fangate. Participants are asked to "Like" Purex before they can enter. Purex has generously offered TWO of my readers the chance to try new Purex Plus Oxi on their own! Just follow the instructions below for your chance to enter to win! Open to USA only, please. One entry per household. All entries will be verified. Giveaway ends on November 4, 2012. Two Winners will each receive a coupon for a FREE bottle of Purex Plus Oxi! 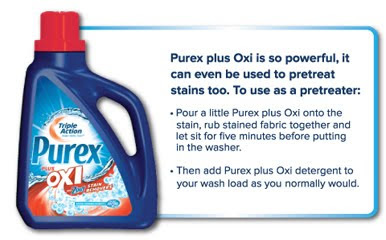 DISCLOSURE: I received a bottle of Purex Plus Oxi for the purpose of this review. I received no monetary compensation. The opinions expressed herein are my own and based on my own use of and experience with the item. Tomato based sauces and grease splatter spots. Tomato sauces! And I love them. Grease and oil, especially bacon grease. Thanks for the chance! Our dirt has so much clay. Its hard to get it out! My toughest stains are the machining oil from my husband's work shirts. Grass stains are the toughest. FOOD stains!!! Oh my gosh, my husband needs a bib Iswear.. FOOD stains!!!! Greasy cooking splatters are tough to get out. My toughest stains are grease from food. Grease splatter spots, and other oils! oil stains from cooking! i always get splattered! grass stains or sweat stains! Really, anything I can manage to get on myself haha. But I love Italian so either red sauce, oil, or red wine. My toughest laundry stains are grease. My toughest laundry stains are anything my 3 yo comes home with on his clothes. Such a busy boy. Biggest problem is keeping white socks white. Thanks for the giveaway. Grass stains on my 8 year olds knees almost every day! Grass stains are my toughest. The hardest dstains are grease and oil. I sometimes get grease on my clothes from cooking, and they are tough to get out. Oil and grease from the hubby! My husband comes home from work, he works construction, and there are things on his clothes that I have no idea what they are! Grease splatters when frying food! Mine are grass and tomato stains. My little boy can make some pretty good grass and dirt stains on his clothes! Grease stains are my worst - Thanks! Ring around the collar for my husband. My toughest stains are ink stains my son gets on his clothes at kindergarten. whatever my 2 little ones wear are always stained!!! I have the most trouble with grass stains. Grass stains for hubby, make up for me! Food stains, like ketchup, chocolate, and juice. With a 2 year old in the house there can be pretty good laundry challenges! Basically the "stuff of life" - to each his own personal stains - and stuff like that. Food, my daughter can be a messy eater. My kids mud stains can be really tough to get rid of! The stains in my fiance's work clothes. Thanks for the giveaway... homemade marinara sauce. sauce is my toughest stain.